a lot of things about my life make more sense. Like what I’m doing with this website, for instance. I’ve been working on this for years. My fears may be life-changing, but they occur within a structure of faith which sustains me. Another thing that is clearer now is why I have so repeatedly adopted the persona of trickster within my Quaker meeting community. The message I bring is so odd, so outside the bounds of consensus reality that it helps that my community is accustomed to hearing odd things from me. `Til now, as I have shared my message, I have been unsure if this transition would reach a crisis point in my lifetime (I’m 69). Now I feel clear it will happen before the end of Obama’s term as president, despite the best efforts of heads of state around the world. What changed my sense of timing was discovering Paul Gilding. He forcefully, sanely, coherently delivers his message in this TED talk. given that, last night, I crossed the threshold of viscerally acknowledging my fears, I want to share what happens next with my community. I offer you a view of my life, in its closing years, as a gift to my community. To my friends, my community, I say “watch me,” from a safe distance, if you like. I’m going out ahead into the fear. It may be that really bad things will happen to me. Like the first person in a company of people going down a jungle path, I offer the risks I am taking as a gift to you, testing the way ahead. If I am felled, you will properly consider another way. Or it may be, if I am right, that going into our fears is where we all need to go for greater sanity in the near term, and greater resilience later on. 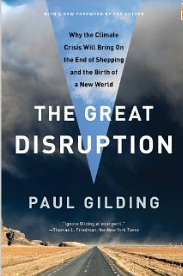 It may be, as Paul Gilding says, that the adrenaline rush I am now experiencing is what our culture will need in order to move into the Great Disruption and to move still further, into a mature and intelligent biosphere: Gaia. This entry was posted in Industrial Civ., Transition. Bookmark the permalink. He supports Paul Gilding’s underlying premise. He has stepped just barely outside his former Wall Street life, set up a little think tank, and is trying to get Wall Street to reform itself.